The sealant for the loop comes in two easy-to-use cartridges. 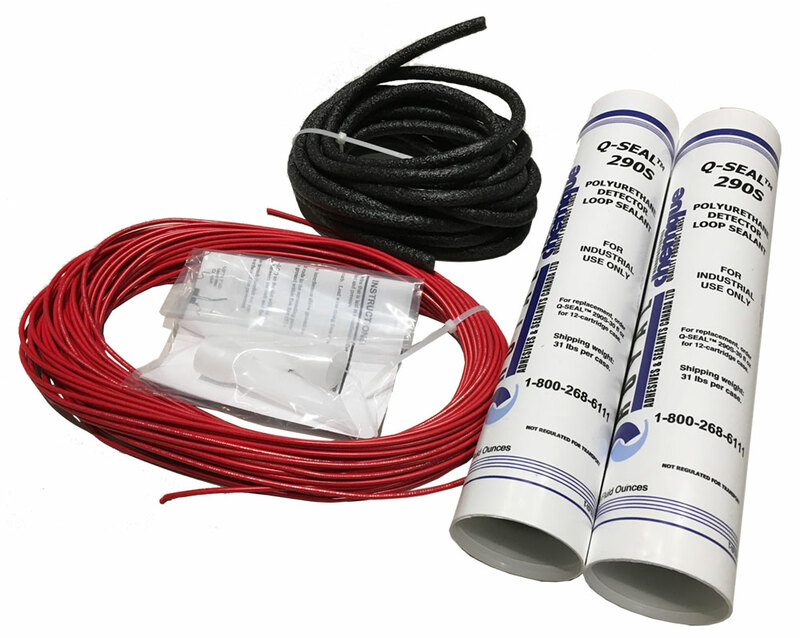 Marsh Products' 867 Saw-Cut Vehicle Detector Loop Kit consists of 100 feet of #16 awg wire, foam spline and sealant for the installation of a five-turn loop. It is ideally suited for vehicle detection in traffic control environments such as drive-thrus or parking lots when connected to the Marsh Products 610 Loop Vehicle Detector. It is also compatible with other brands of vehicle detectors. A concrete saw is used to cut a rectangular pattern in the concrete or asphalt. The kit is intended to be used after pavement installation; if pavement has not been poured, the Marsh Products 865 Preformed Loop is more cost-effective and easier to install. The kit comes complete with enough wire, spline and sealant to create a five-turn loop measuring 18 by 54 inches. The sealant requires no mixing, dispenses easily with a cartridge gun and is inexpensive to ship by all methods. White Paper: The Basics of Loop Vehicle Detection. 100 feet of #16 awg machine tool wire for 18-inch-by-54-inch saw cut. Sealant dispenses directly from container with cartridge gun. Can be shipped overseas and by overnight air. Withstands corrosive effects of road salts, auto fluids and gasoline. Connects directly to the Marsh Products 610 Loop Vehicle Detector. Click here for a printable copy of the installation instructions. For five years after you purchase a Marsh Products Saw-Cut Loop Kit, we will repair or replace (at our discretion) any malfunctioning hardware. The purchaser pays only the shipping to return the malfunctioning part to us. The warranty is void if the product is returned in a damaged state for any reason, including damage that occurs because of a failure to follow installation instructions.